Lately, I have been seriously slacking on the healthy eating. I just can’t keep myself away from chocolate and other delicious foods. Since one of my goals, for the New Year, is to eat healthy, I better start right know! Today I am sharing one of my favourite breakfast recipes. As you might have seen previously on the blog, we can conclude that I am a bit obsessed with porridge. I don’t know what it is, but I love it! Put the oats, flax seeds, chia seeds, hemp seeds, ground cinnamon, cayenne pepper, ginger powder, agave nectar and the water in a small saucepan on a stove. Turn up to medium heat and keep stirring until it is getting a thicker consistency. Add the raisins and the crushed walnuts to the porridge and keep stirring until the porridge is perfect. 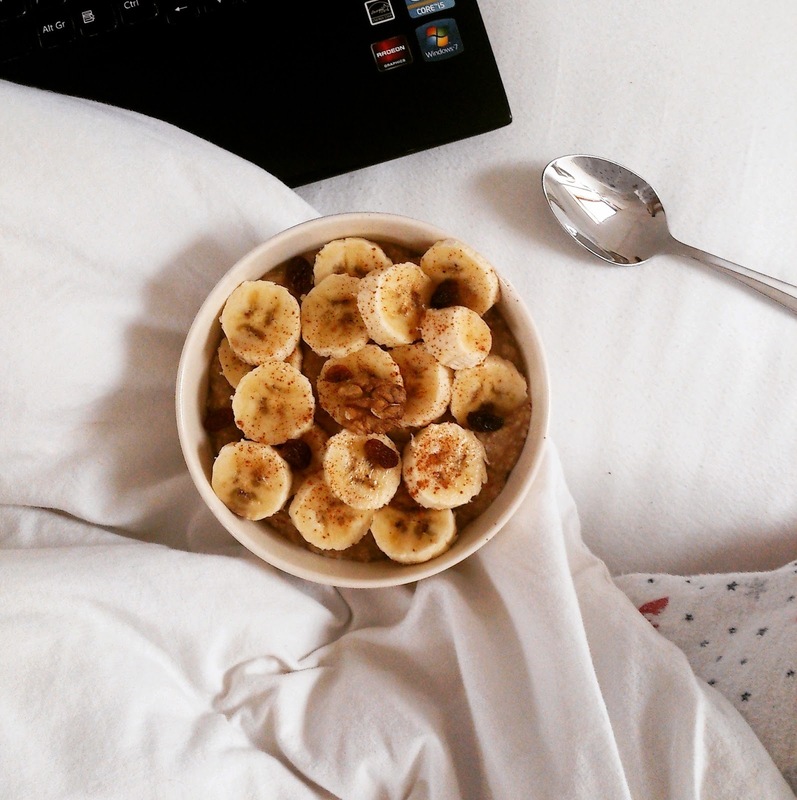 Scoop the porridge in a bowl and top it off with slices of banana and a sprinkle of cinnamon. You can add some raisins and walnuts on top if you like that. That is it: your homemade porridge is done! Full of healthy fibers and vitamins to get your metabolism going! I try to eat healty breakfast like this but I not that into yogurt. But I am going to try this tomorrow! i love having oatmeal for breakfast but i'm too lazy to make it myself haha, might have to try this though! looks so good and healthy too!! That looks absolutely delicious and the perfect breakfast to start the day full of energy, I'm definitely going to try this! wow. I love your blog. Mmmmm this looks sooo yummy! I love breakfast foods!